Earlier this week, I shared how to give metal a rich, vintage patina. Today, I want to share a variation of that technique that uses the same materials but achieves a very different look. For all my sweet friends who worry about me biting off my than I can chew, let me show you the room full of cabinets I recently redid. Yikes! No really, it was a joy to restore and create and do it for my church’s new building, along with the help of several friends. So… on to the tutorial. Step 1: Sand down entire piece lightly with 220 grit sandpaper. We used palm sanders (7 going at one time – that was LOUD!) and were very pleased with the result. Remember, you’re just removing the sheen, not the paint. Step 2: Lightly wash with ASCP graphite with clear, straight brush strokes. To create a wash, simply water down your paint. We actually just dipped our brushes in cups of water before the paint can. Be sure your brush strokes all run parallel to one another; you’re beginning to create the “brushed” look even at this layer. Step 4: Mix paste wax with Briwax dark wax (1:1 ratio) and add a squirt of silver craft paint. Because we had 20 cabinets to redo for church and saving money was a major goal, we decided to cut cost by mixing paste wax (a much cheaper wax than AS or other boutique brands of soft wax) with Briwax. Briwax runs $15-20/can and is a VERY soft wax (liquid above 65 degrees), so the combination of Briwax and paste wax create a nice, soft, paintable dark wax. The squirt of silver craft paint is to give it that slight sparkle. I probably only used a dime size of craft paint for every 1/2 cup of wax – just a little touch. Step 5: Wax the entire piece using a traditional latex brush and smooth, straight brush strokes. This step darkens the color, protects the piece, and further enhances your “brushed” look. A latex brush (though not normally my choice for wax) worked beautifully with our very soft wax mixture and increased the look of the brush strokes. Here you can see a piece merely washed with paint (foreground) and waxed (background). Step 6 (OPTIONAL): If you desire more of the “brushed” look, lightly sand with your 400 grit sandpaper in the direction of your brush strokes. Then repeat wax. Step 7: Buff in direction of brush strokes to desired sheen. Even this step contributes to the brushed steel look, so be sure to continue in the same direction. 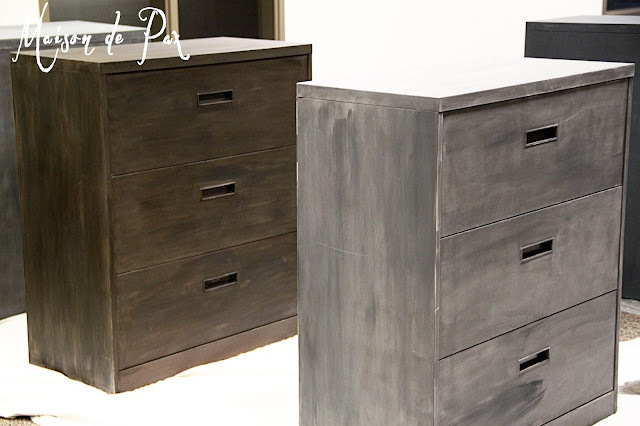 In the end, we were able to refinish 20 solid metal filing cabinets for around $150. The cabinets were free, so the cost was limited to the paint and waxes. I’m not totally pleased with the pictures (no natural light, etc. ), but trust me, the cabinets look really cool! And now the cabinets are ready for the industrial-chic offices they will fill. And remember, depending on your base color, you can achieve a variety of different finishes. Looks wonderful ! Thanks for the tips. Looks like God blessed your church with lots of talent . I love what you did to the file cabinets! What paint color/wax, etc. would you recommend if you started with a tan/beige metal cabinet? Thanks! These file cabinets are beautiful! I used this technique and it looks great. I would like to ask if you have a recommendation though. I looked for Briwax everywhere and could not find it so I had to substitute Minwax instead. The cabinets look beautiful but the problem is that after two days they are still sticky. Do you have a suggestion for what I can do? Should I spray or paint something over it? Any thoughts would be appreciated. Thank you! I’m so glad you like the cabinet! I can’t say I’m the expert on Minwax, but I will tell you that it takes several weeks for most waxes to fully cure. 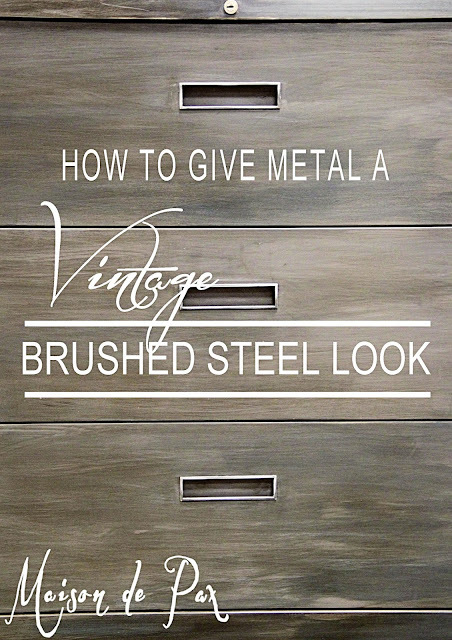 Especially when on metal (because the wax doesn’t absorb into the metal like it does into wood), you’ll want to treat it delicately while it hardens. I bet if you can treat it gently for a few weeks that the stickiness will go away. Hope this helps and good luck! I think you did an awesome job. Well Done, they look great! I hope i have the nerve to try with the one cabinet i have, don’t really want to throw it out. I’ll follow your lead, thanks. will this wrok on a coloured metal cabinet? I think it depends on what color, Ashley. You could certainly try it… As you can see, we had some that started gray and some that started cream. It was much easier to achieve the look on the gray ones with just a light wash of the paint, but the cream ones required a more complete painting before we could use the wax over them. I haven’t tried any other colors… Hope this helps! 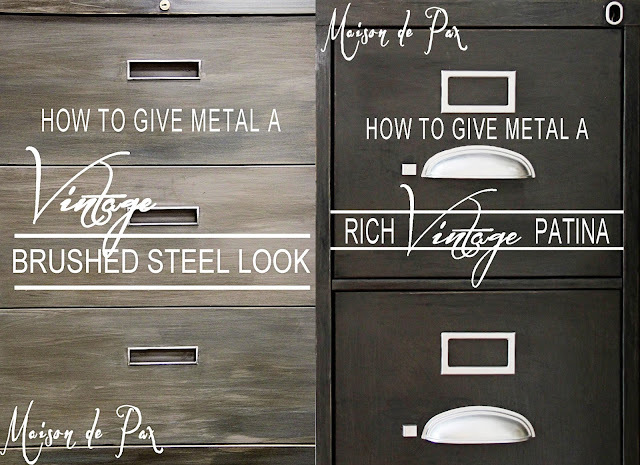 Hello, I stumbled across this in Pinterest and thought it would be cool for my son’s desk that is made out of 2 metal filing cabinets. They are painted brown. Do you think the graphite chalk paint and dark wax would work for this or should I use black or another color chalk paint. I even wondered about watering down some chalk paint (I have some on hand)? 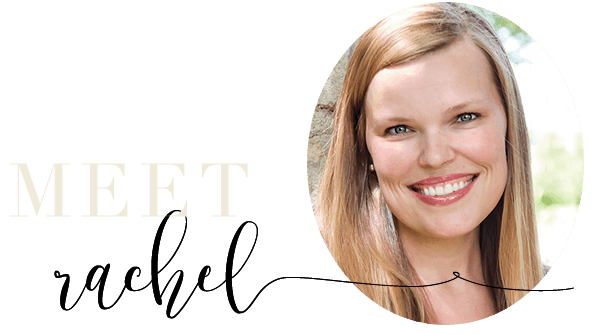 Hello Rachel! 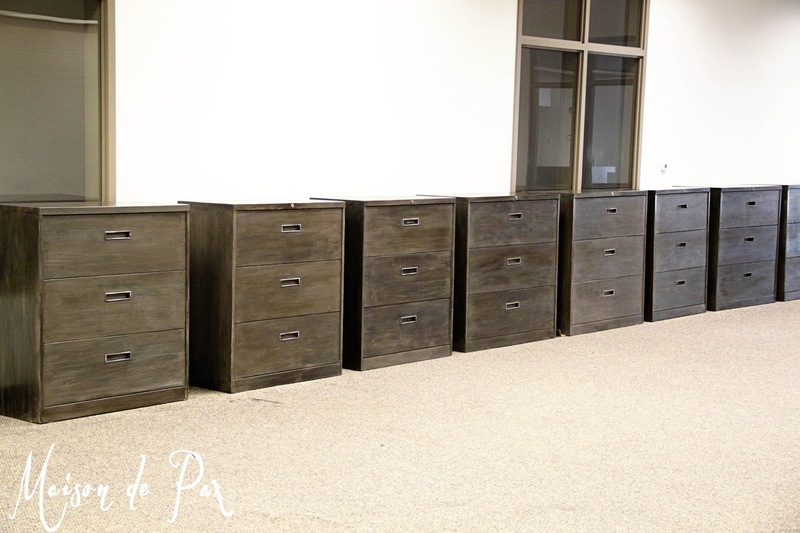 I have 2 small grey and 1 large tan file cabinets. The 2 small grey ones are DONE! I love the look!! I went with a full paint on the grey cabinets as well to get the same base on all (regardless of color). The big (tan) file cabinet is in the garage drying (chalk paint), as we type. My fingers are crossed about the finished product. The 2 small ones are still showing smudges and such after 2 weeks and I’m afraid to put my printer atop one of them (which was the plan). After reading previous posts, it’s my understanding that I need to wait a while longer for them to “hard set”. What if, for some reason, they don’t? Can I spray a clear coat over the wax? Hi Traci! I’m SO glad you like the result! I confess that I don’t remember exactly how long it took for the wax to cure (and it will depend on how thick you applied it and the humidity in your area), but I do think it was closer to 1-2 months. Hold out as long as you can as another clear coat could keep it from ever fully curing. I hope this helps! Hi there! What color of stain/wax would you recommend if the filing cabinets I have are black? Hi Christi, you might take a look at this post which has one I did that started black. If you want it to turn out looking more like these, you will either need to find a lighter gray paint or give it a full coat of the Graphite (rather than just a wash). Hope this helps! On my filing cabinet each drawer is a different shade of orange…think 1970s. Do you think this could still work? I want it to end up basically black. 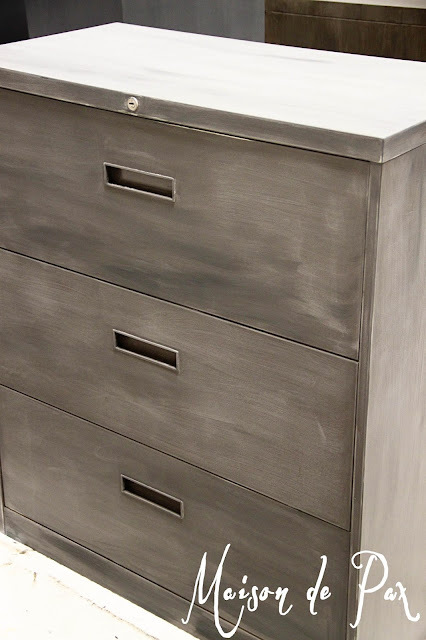 You may have some warmer undertones with orange drawers, but you can always put the graphite colored paint on thicker (rather than a wash). It’s really the deep graphite paint with the wax put on as described that should give it the striated look of brushed steel. Hope this helps and good luck! What would be your tips for fixing up old previously painted metal cabinets in my kitchen ? there are at least two layers of paint on them now. Yuck…. Oh man, layers of paint on old metal is tough… I would probably be inclined to try one of two things: 1) consider stripping them. It would be a ton of work, but it would give you a clean slate to work with, and then you can achieve almost any finish you want. 2) try sanding the worst of the chipping (if there is any) off and using a chalk paint of some kind for a nice, solid color. You just want to make sure you get off all the old paint that isn’t adhering well so your new paint color will stay. I hope this helps in some way! Do you have any photos of the cream colored cabinets you did? I’m sorry, I’m afraid the only pics I seem to still have of the cream ones are in that second image in the post: the full room with the finished one in the foreground. The ones that appear darker than the others started cream; we had to give them a fuller paint coat with the ASCP to make them darker. Sorry I don’t have finished pics! Did you wait for the chalk paint to dry before waxing or put on the wax when it is damp? I love this idea! I have a tall metal filing cabinet with two doors and 4 shelves, it’s a darker grey color. I really love this look, how do you think it will work out with the darker gray, before I even attempt it! I would love to try this finish on aluminum outdoor furniture but do u think it would hold up to the outside elements? I’m sorry, the wax is not meant for outdoor finishes. I have bought old beige filing cabinets – would like this process work on that finish as well? Thanks! Hi! I’m going to do this! Where did you get your wax and paint? So glad you like it! I purchased that wax and paint locally several years ago, but you can get Annie Sloan products online through (affiliate link) Royal Design Studio. I hope this helps! to you and friends on the final product. My cabinet is white, any suggestions on paint color for a white cabinet? Hi Terry! Depends on whether you like crisp whites or warm whites. Check out Simply White by Benjamin Moore or White Dove for something warmer. 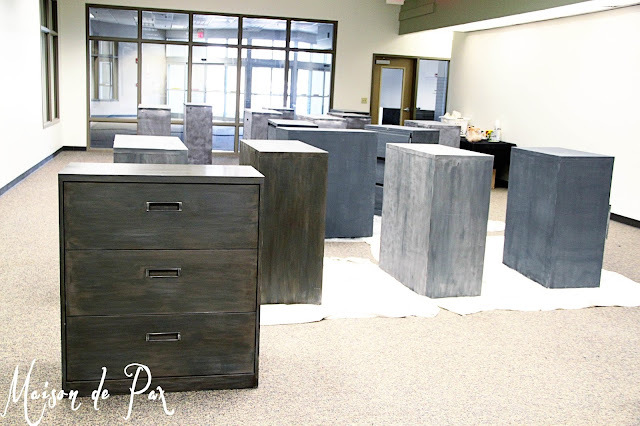 I am wanting to do this and add a wood counter top but my question is if I have 3 different colored filing cabinets how can I make them all match?? We had some that started light tan and others that started almost black… The more graphite paint used, the more uniform they will look. Painting onto metal is always challenging, but the chalk paint seems to adhere pretty well. If you simply paint the cabinets rather than just creating a wash, it should help make them look more uniform. I hope this helps! 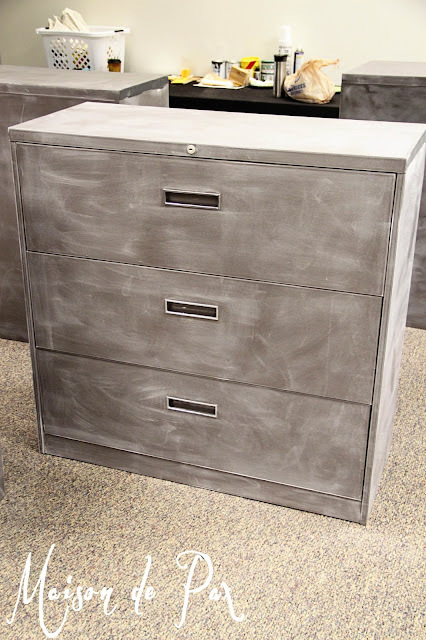 Do you sell filing cabinets already with the brushed steel look? I’m sorry, Cory! I don’t sell cabinets. So glad you like it, Kelley! I actually used the one called “dark brown,” but if you’ve already bought ebony, it might not be a bad idea since I started with gunmetal colored cabinets and yours is beige… I hope it works out for you!